OK. So it's not winter quite yet. However, the weather around here belies that fact. Chilly wind and below freezing temperatures have us bundling up to venture outdoors, and upping the cozy factor indoors. Six of us gathered on Friday evening for dinner. One couple brought appetizers, another brought a salad and beverages. We provided the main course, paella, and bread, along with spiced wine poached pears for dessert. We laughed, we ate, we drank, we talked around the table as the candles burned low and the pearl garland in the light fixture overhead gleamed. Simplicity of white and red. Gathering together in the warmth of friendship is an age-old defense against the cold outside. Looks like a perfect evening. You should post that "go-to" recipe! Love the tablescape with the pretty red and white. Sounds like a wonderful evening with your friends. Have a happy week! What could be warmer than the great company of friends, good food, and a cozy ambiance on such a wintery night?! Although I use red and white all year round, I especially cherish it during Christmas. Your table, set with this combination is cheery and inviting. So just how did you get that overhead shot? It is so lovely, Lorrie. Your red and white table looks wonderful. We are having snow here. Oh that sounds just amazing and your table is gorgeous - wonderful photos!!! Regarding your last comment on my blog - yes I would swap locations with you any day of the year except at Christmas. Beautiful... I'm drawn to red this season... and your table setting is perfect! What a lovely table you set and how warm the fellowship around it. 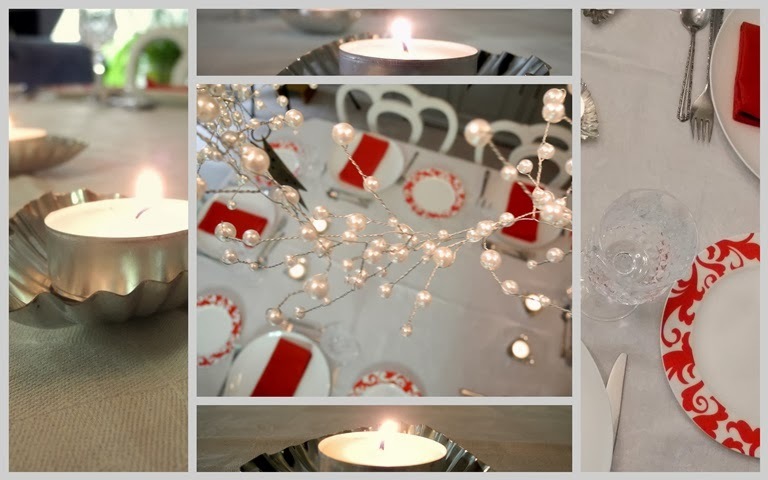 The red and white table is perfect for a gathering of friends and the menu, scrumptious. Red is the perfect pop of color for entertaining! I'm glad that you are enjoying the season! You've inspired me. I'd love to plan a dinner party! The table looks lovely....so classically beautiful! Sounds like a nice dinner party. Happy holidays! What a beautifully set table...so festive and cheery! There is nothing like a great meal and fellowship with friends. What a beautiful table Lorrie! I love it and were you on a ladder to take this great high shot!? Glad you had a great evening. Oh what a pretty setting - and it sounds like a perfect evening. Your table looks so beautiful Lorrie. I love the red rimmed plates and the pearly garland over the whole thing. I've never had paella but your photo on the previous blog post looks delicious. It sounds like you had a wonderful evening with your friends. It sure is cold there!! Unusual. Sounds lovely! Yes, the cold is best born with friends. Such a pretty table! I'm sure that must have been a splendid evening. . .
What a convivial gathering Lorrie! Your white and red theme is beautiful - I love the touch of the pearl garland and the pretty tea lights on the table. Shared dinners are a lovely idea - they are called "pot luck dinners" here! You've set a lovely table, Lorrie. A potluck dinner at someone's home sounds like a wonderful idea. And a great idea to gather the warmth of friends. Now did you have to climb on the table, that's a great shot! Love the simple color scheme, it's stunning. I need to venture out this morning, finally got some decent snow. These are lovely pictures, Lorrie, and the last sentence of your post -- Well Said! Such a crisp, inviting and welcoming tablescape-perfectly suited for a December evening-I can almost hear the laughter and great conversations! A pretty setting and sounds like a very yummy meal. Some of the best conversations are when sitting around the table with friends and good food.